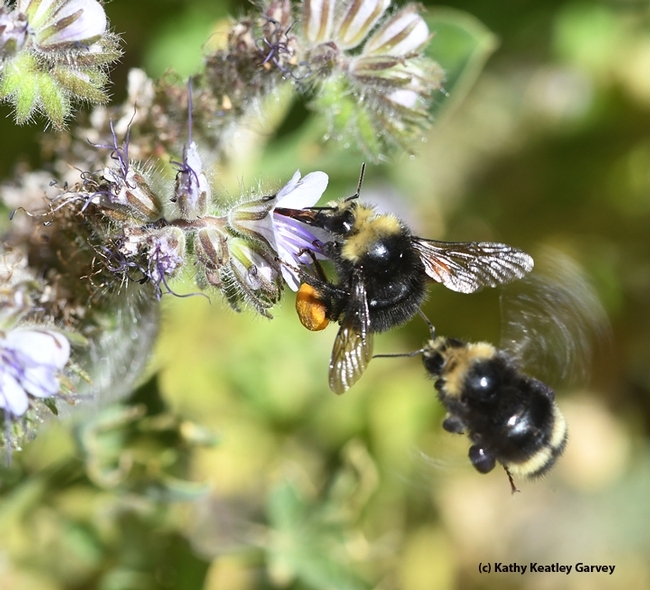 The bumble bees, Bombus vandykei (as identified by Robbin Thorp, distinguished emeritus professor of entomology at the University of California, Davis), were buzzing all over the Phacelia last week on the central campus. One bumble bee carried a heavy load of orange pollen (collected nearby), while another, a small load of blue pollen. They both wanted the same flower. I'll have what you're having! Move, please. Sorry. I'm not finished here. She didn't move. Not then. 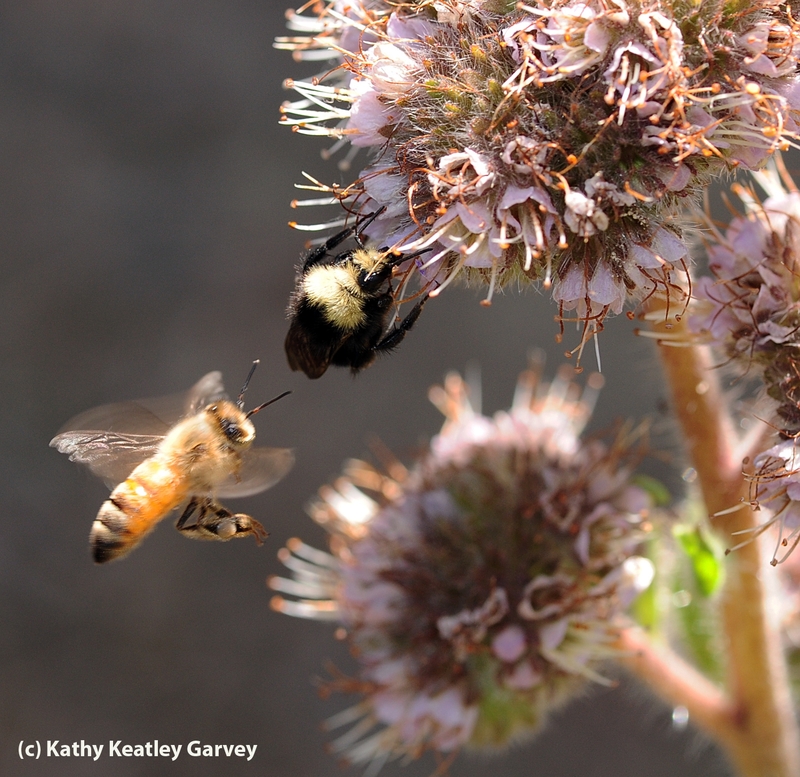 Both the bumble bee and the plant are natives. The genus Phacelia, also known by its common name, phacelia, or scorpionweed or heliotrope, is native to North and South America. Its genus includes some 200 species. 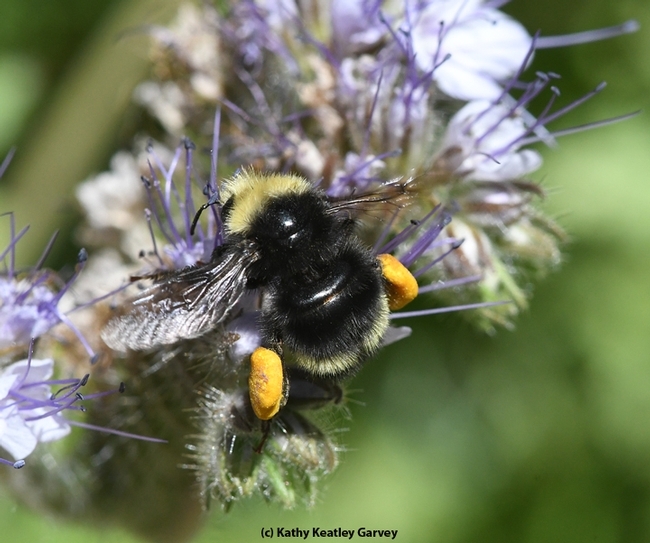 VanDyke's Bumble Bee is found in the Pacific Coastal states, including Washington, Oregon and California. 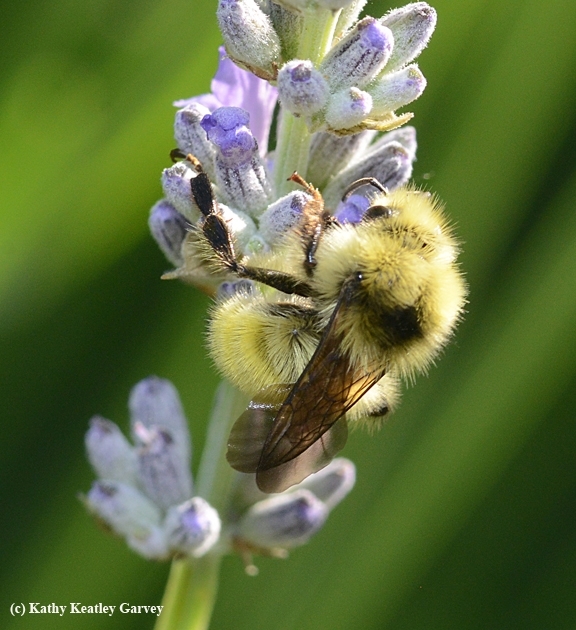 Bombus vandykei is one of about 250 described species of bumble bees worldwide. All belong to the genus, Bombus. The vandykei males are extensively blond, but not the females. In fact, the females are often confused with the yellow-faced bumble bee, Bombus vosnesenskii. (A distinguishing feature: on the vandykei, the yellow abdominal band is on T3 rather than T4.) See BugGuide.Net. 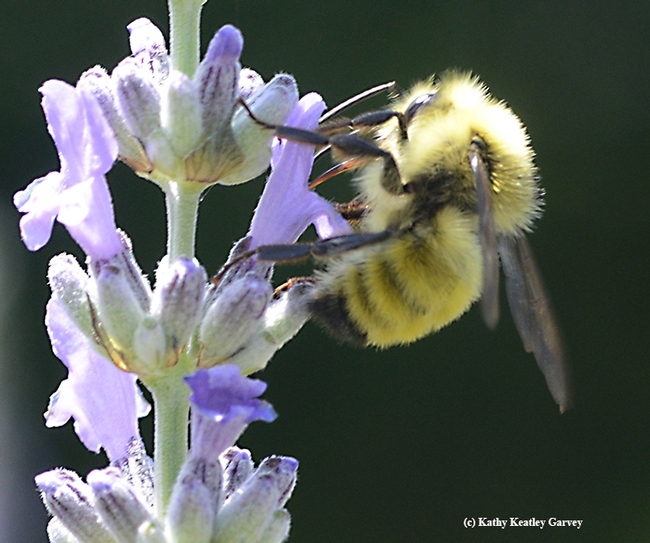 Want to know more about bumble bees and how to identify them? 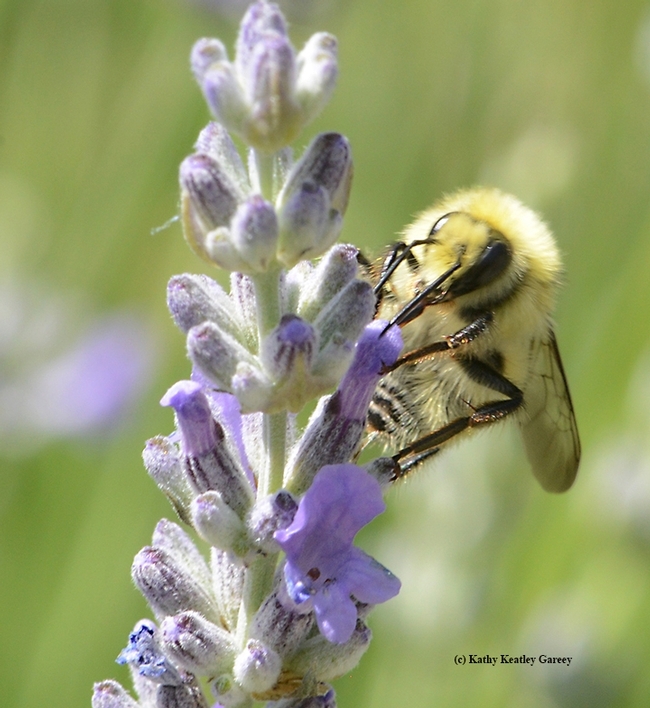 Be sure to pick up a copy of Bumble Bees of North America: An Identification Guide (Princeton University Press), co-authored by Thorp and fellow scientists Paul Williams, Leif Richardson and Sheila Colla. It won a 2015 Outstanding Reference Sources Award, Reference and User Services Association, American Library Association. A really innovative touch to the Princeton University site is the buzz. Click on the link, http://press.princeton.edu/titles/10219.html, and you'll hear the buzz. It's just like being in a Phacelia patch filled with bumble bees! He's racing through the lavender patch at breakneck speed, as if he's going to be charged with nectar robbing. The male Bombus vandykei, an engaging blond bumble bee, twists, turns and zig-zags through the long-stemmed lavender. There is no one in pursuit. Well, except for me and my trusty camera. I'm stationary. The camera is not. Neither is Mr. Van Dyke. In his morning mission for flight fuel, the golden blob of a bumble bee visits a dozen lavender blossoms, sipping breakfast as if it's a smoothie, and then he's off and running. Buzzing, really. I don't know where he's going but I hope he knows where he went. The welcome mat is out. Just another day in the lavender patch. But a beautiful day to sight the male Van Dyke bumble bee. It's so blond that all you can say is "Wow!" It's sort of like the Reese Witherspoon of bumble bees. But then the gender doesn't match. Okay, the Owen Wilson of bumble bees. 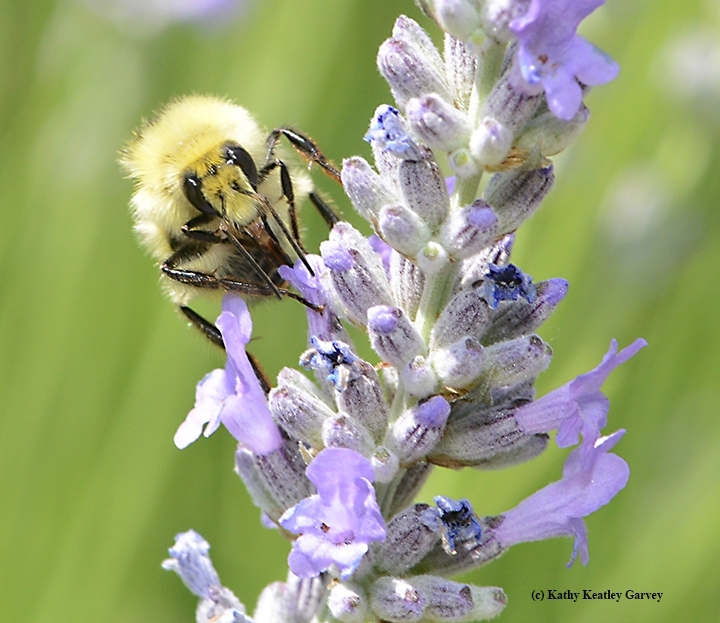 The male Bombus vandykei, commonly called "The Van Dyke Bumble Bee," is a treasure for three reasons, not necessarily in this order: (1) it's a pollinator (2) it's a bumble bee and (3) it's the color of golden wheat. 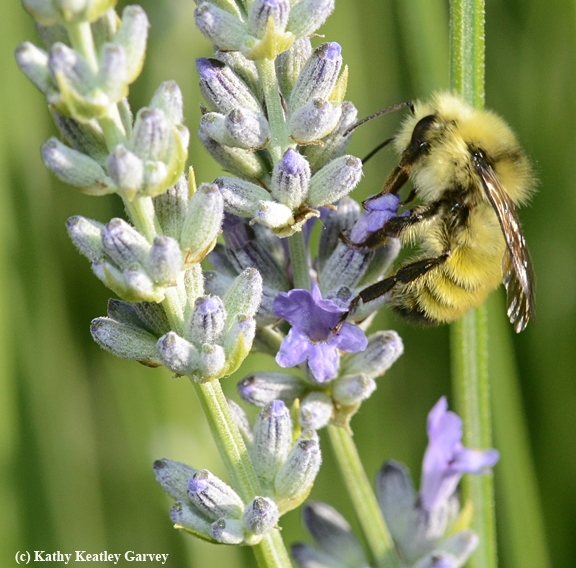 We spotted a male Bombus vandykei foraging in our lavender patch last night around 6. Its color reminded us of two other bees: the male Valley carpenter bee (Xylocopa varipuncta), a green-eyed blond bee nicknamed "The Teddy Bear Bee"; and the blondest of the blond honey bees, the Italian Cordovan. The Italian, Apis mellifera ligustica, is a subspecies of the European or Western honey bee, Apis mellifera. The Van Dyke Bumble Bee gets around. The species is found in the Pacific Coastal states, including Washington, Oregon and California. The boys are extensively blond, but the girls aren't. In fact, the females are often confused with the yellow-faced bumble bee, Bombus vosnesenskii, and the black-faced bee, Bombus californicus. Bombus vandykei is one of about 250 described species of bumble bees worldwide. All belong to the genus, Bombus. Want to know more about bumble bees and how to identify them? 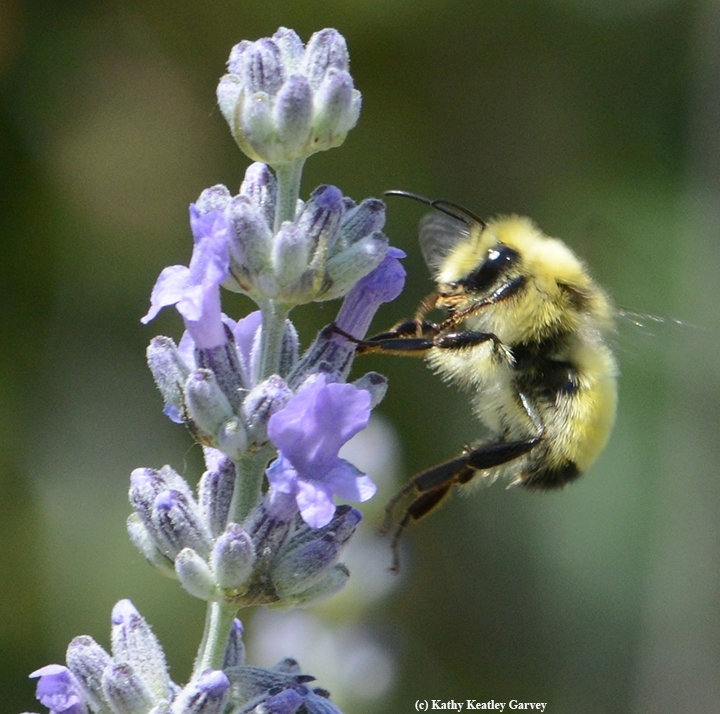 Be sure to pick up a copy of Bumble Bees of North America: An Identification Guide (Princeton University Press), co-authored by bumble bee expert Robbin Thorp, distinguished emeritus professor of entomology at UC Davis, and fellow scientists Paul Williams, Leif Richardson and Sheila Colla. It won a 2015 Outstanding Reference Sources Award, Reference and User Services Association, American Library Association. If you click on the Princeton University link, http://press.princeton.edu/titles/10219.html, you'll hear the buzz. That's the buzz of bumble bees beckoning us to listen to them. The first thing you notice when you walk up to the Harry H. Laidlaw Jr. Honey Bee Research Facility on Bee Biology Road, UC Davis, are the natives. California golden poppies and phacelia are among the plants sharing the "Pollination Habitat" bed. The golden poppies literally light up the landscape. The phacelia, not so much. The next thing you notice are the bumble bees, carpenter bees, honey bees and syrphid flies foraging on the natives. An occasional butterfly flits by. 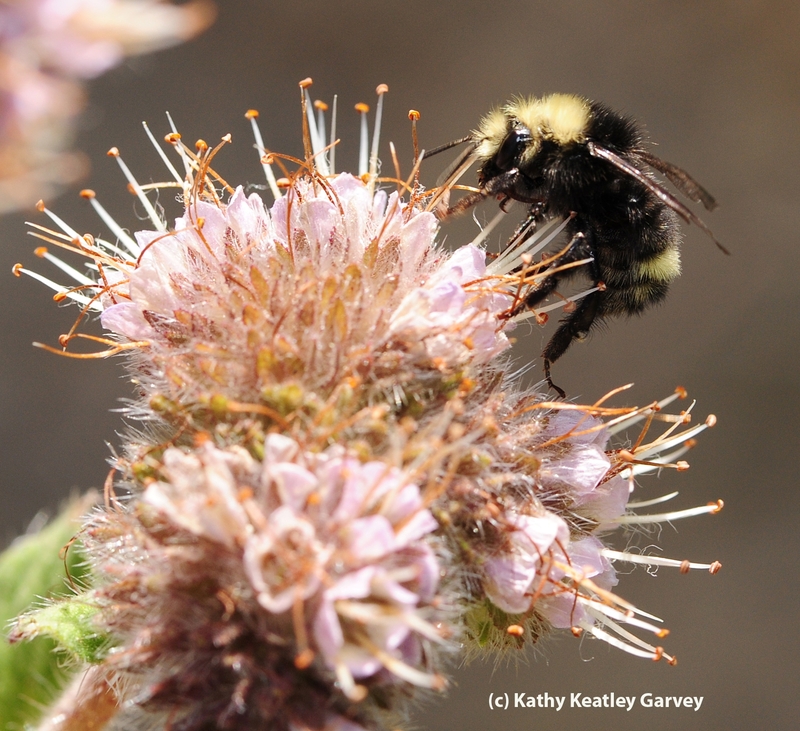 Today a bumble bee, Bombus vandykei, buzzed from one phacelia to another. She was interested only in phacelia. Nothing else, thank you. She quickly found herself competing with honey bees for the nectar and pollen. "This area has been placed with a range of flowering native plants to provide hgh waulity habitat for native bees and other pollinators. 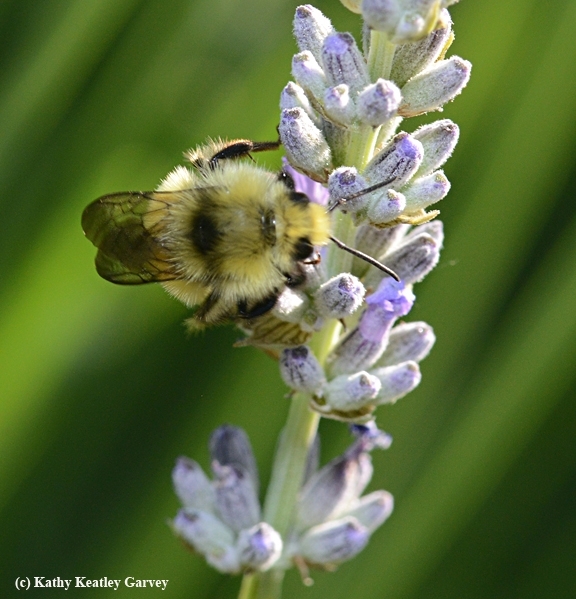 To learn how you can create good habitat for pollinators please visit www.xerces.org." 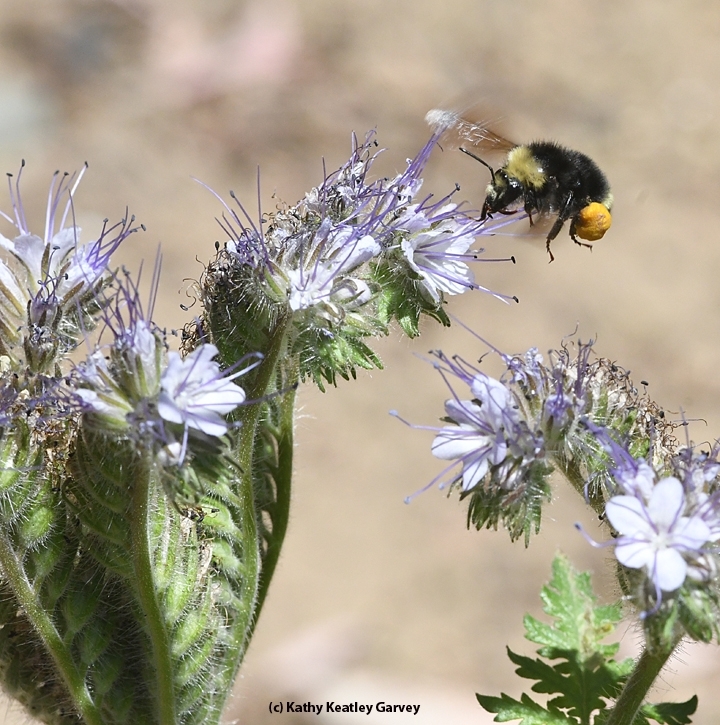 Phacelia is one of the bee plants recommended in G. H.Vansell's booklet, Nectar and Pollen Plants of California (Bulletin 517). 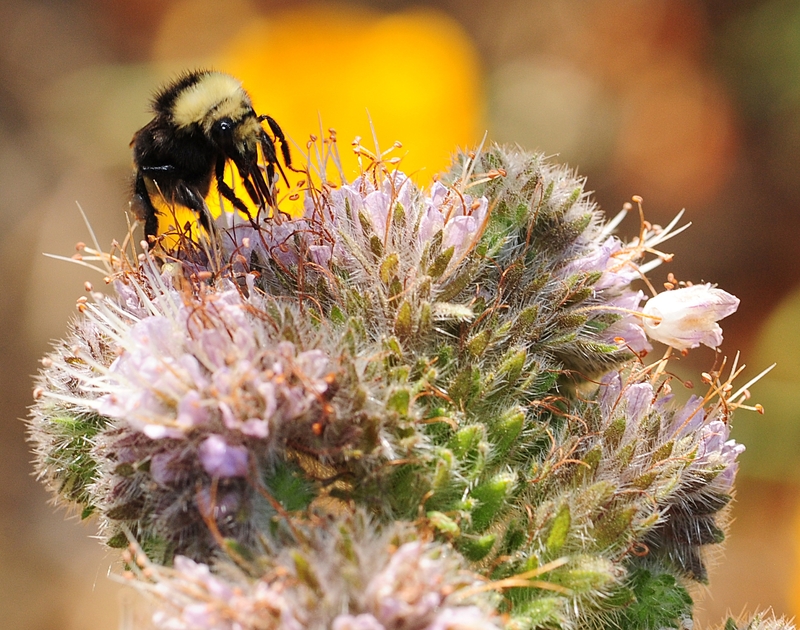 Extension apiculturist Eric Mussen of the UC Davis Department of Entomology, mentions phacelia in his list of good bee plants in a 2002 edition of his newsletter, from the UC apiaries. 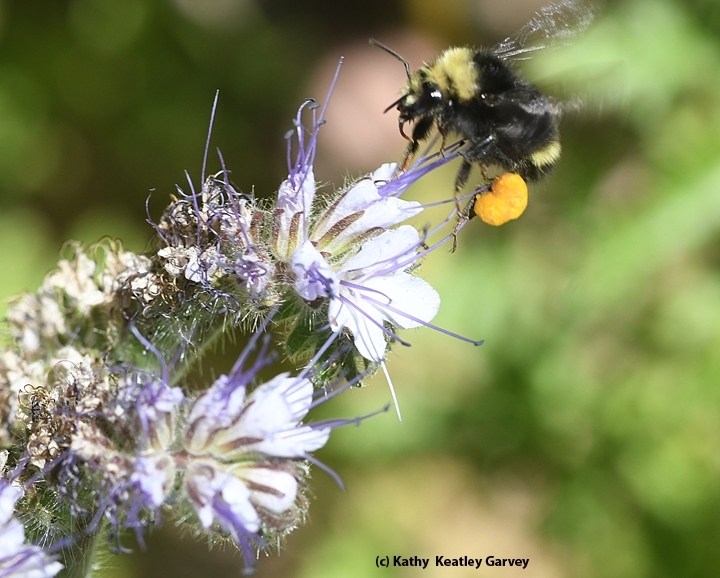 And phacelia is also a plant that pollination ecologist Neal Williams, assistant professor of entomology at UC Davis, is studying.